Update: Terror Attacks on 3 Continents Kill Dozens. Was There a Connection? 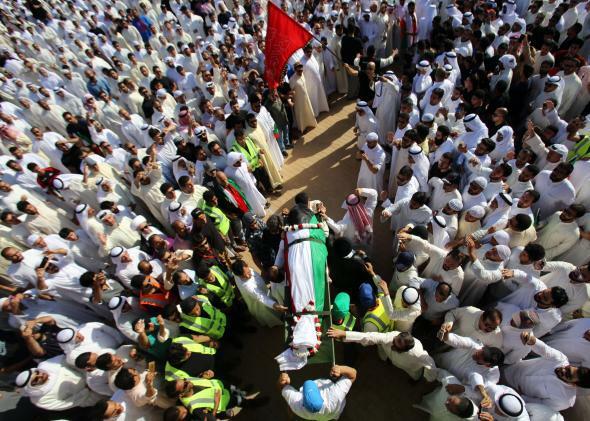 Mourners carry the body of one of the victims of the Al-Imam Al-Sadeq mosque bombing, during a mass funeral at Jaafari cemetery in Kuwait City on June 27, 2015. More details have emerged on the trio of horrific attacks that took place yesterday in France, Tunisia, and Kuwait. The latest report on the attacks from last night counted at least 65 people killed in all three incidents. The Associated Press reports that it is unclear whether the attacks were coordinated but Islamic State (ISIS) affiliates have claimed credit for both the massacre of tourists with an automatic rifle at a beachside resort in Sousse, Tunisia, and the bombing of a Shi’ite mosque in Kuwait. The attacks also took place shortly after ISIS militants released an audio recording urging their followers “to make Ramadan a month of calamities for the non-believers”. This morning, the AP reports that Tunisia’s health ministry has confirmed the nationalities of ten of the 39 victims of the Sousse attack, including eight Britons, one Belgian and one German. The Irish government has additionally confirmed that one of its citizens was killed. The bloody event is already doing major damage to Tunisia’s tourism industry; European tour operators were busy today evacuating their customers from Tunisia by the thousands and canceling planned trips. The perpetrator of the attack, Seifeddine Rezgui, was shot to death by police who responded at the scene of the crime. Rezgui, who came from a poor village and had never traveled outside the country, was apparently unknown to Tunisian authorities before yesterday. UK Prime Minister David Cameron warned citizens today that as the rest of the dead were identified, most of them were likely to be their fellow Britons. Yesterday’s killings have exacerbated already heightened fears of imminent terrorist attacks in the UK, and police there say they are beefing up security at the country’s major tourist attractions, including the Wimbledon tennis courts, where the eponymous world tournament is set to begin on Monday. A group in Saudi Arabia, calling itself Najd Province, which said it is affiliated with Isis, named Abu Suleiman al-Muwahhid as the mosque bomber. The group said that the mosque had been promoting Shia Islam, which it considers to be heresy. The statement on Twitter said the bomber had targeted a “temple of the apostates”. The same group had claimed responsibility for a pair of bombing attacks on Shia mosques in Saudi Arabia in recent weeks. is suspected to have driven to the Air Products depot at Saint-Quentin-Fallavier, a short drive from Lyon, in a Peugeot Boxer around 9.28am local time on Friday. The suspect then allegedly rang at the gate of the depot belonging to the US-based company, which stocked liquid gas for industrial use, and showed a badge that gave him the authority to enter into the first security zone. … CCTV cameras show the driver suddenly accelerating into a second gate around a more protected area and ramming into gas tanks. Injured in the crash, he managed to get out of his car and ran into a covered hanger filled with bottles of liquid air, gaz and acetone. He then opened the valves on the bottles before trying to set them alight, when firefighters arrived. French president François Hollande held a crisis summit today in response to the incident, and French authorities are investigating possible connections to international terrorist groups, but have disclaimed any connection between this incident and the attacks in Tunisia and Kuwait.